Hotel Rey Juan Carlos I, a unique resort in the heart of Barcelona. Located on the Diagonal, the city’s main avenue, our Barcelona luxury hotel is just a walking distance from the shopping, cultural and financial centres. The comfortable and spacious accommodation features the latest facilities and outstanding views over Barcelona. 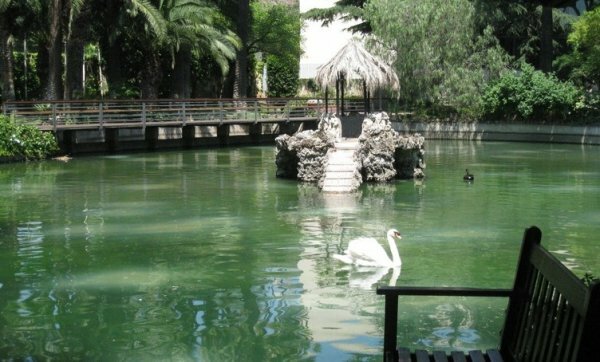 Our 19th century Mediterranean gardens and outdoor pools create a tranquil resort in the city centre. 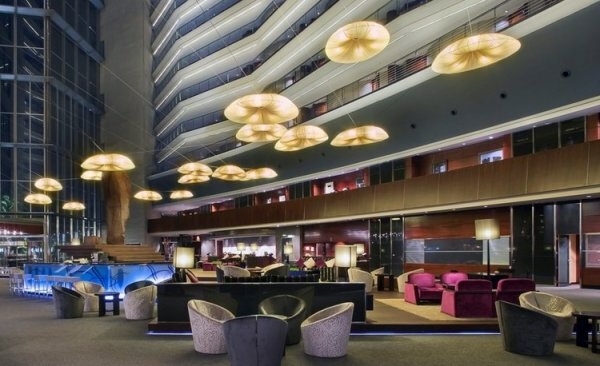 With 432 luxury rooms and professional conference facilities, Hotel Rey Juan Carlos I is the ideal location for a business or leisure visit to Barcelona. Relax and unwind with our spa and fitness centre. 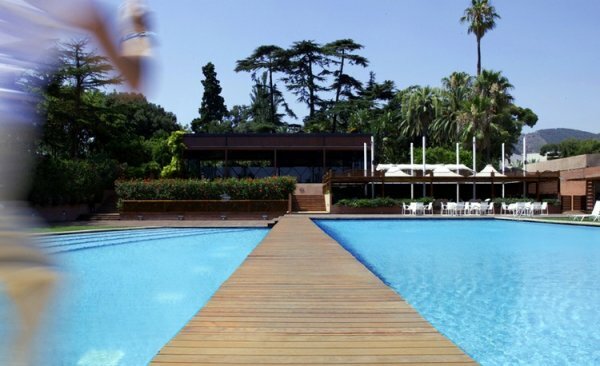 The Royal Club Fitness & Spa is located in the lush gardens of the Hotel Rey Juan Carlos I. Experience the ultimate in relaxation and tranquillity surrounded by our gardens and swimming pools. The Royal Club Fitness & Spa designed by the prestigious architect Carles Ferrater and decorated by José Cortés with art-works of the painter Xano Armenter, designed as a reference of the architecture and well-being in Barcelona. The center is situated in the urban resort Hotel Rey Juan Carlos I surrounded by 25.000 m² of lush Mediterranean gardens of the past century. With more than 5.400 m² of infrastructure with a natural light, the magazine Conde Nast Traveler included it in its Top 10 Best Fitness Center worldwide. The personnel´s goal of The Royal Club Fitness and Spa is to reach the well-being throughout a large choice of esthetic, relaxation and beauty cares with the best cosmetic products. The Royal Club has a prestigious medical team, Sports Medicine Barcelona, situated in the same buildings and which discipline, sportive medicine, have a lot of supporters that are looking for balance and harmony between the body and the spirit. 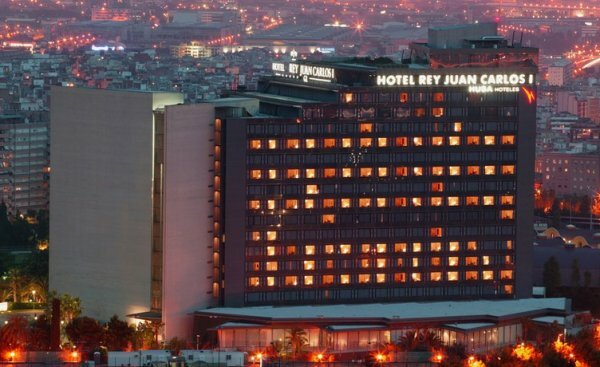 Hotel Rey Juan Carlos I meeting facilities provide the ideal venue for a successful meeting in Barcelona. 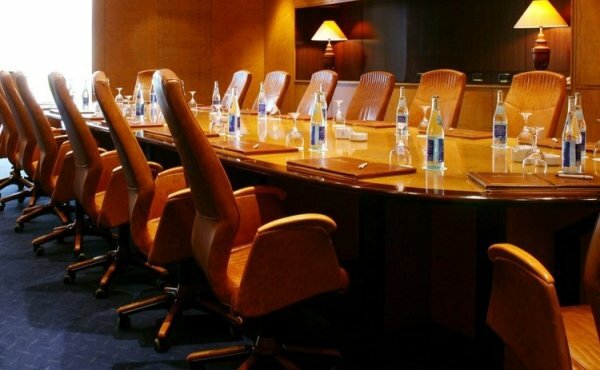 Hotel Rey Juan Carlos I offers outstanding meeting facilties on the prestigious Avenida Diagonal of Barcelona, the most important financial and business centre of the city. The Palau de Congressos de Catalunya has 35 halls and rooms of varying sizes. The grandiose Auditorium can hold a maximum of 2,027 delegates. The maximum exhibition space is over 4,000m² with a capacity for banquets catering for up to 3,000 diners. 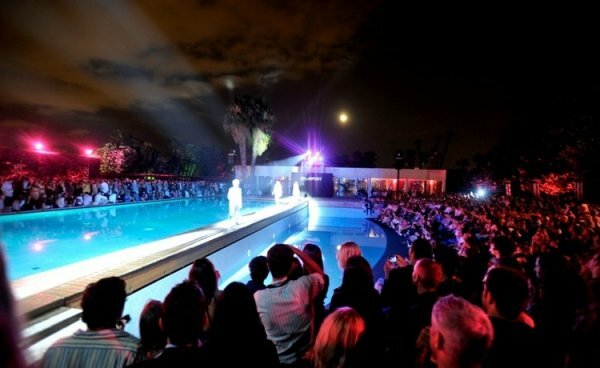 Hotel Rey Juan Carlos I event facilities offer the ideal venue for a successful event in Barcelona. 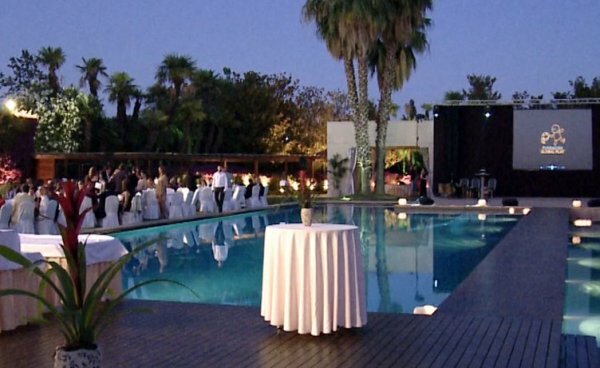 Our Barcelona event hotel can accommodate a group of guests in up to 350 rooms. Hotel Rey Juan Carlos I presents 14 versatile meeting rooms. Our Fresh Bar is also available for private hire. 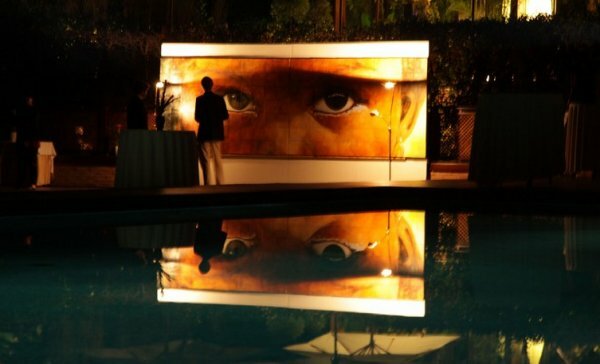 Two fixed marquees are located in our expansive hotel gardens. Our lush gardens and spectacular pools offer a unique backdrop for a gala dinner, business lunch or banquet. 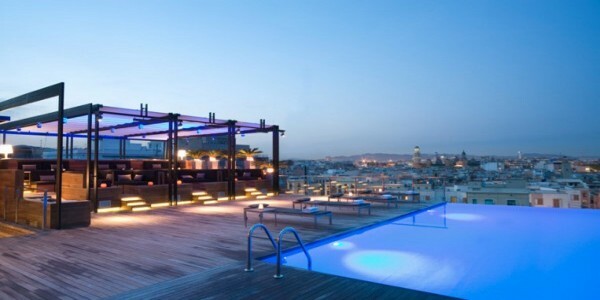 The Hotel Rey Juan Carlos I Standard Rooms (30 m²/ 323 sq ft) have impressive views of Barcelona. 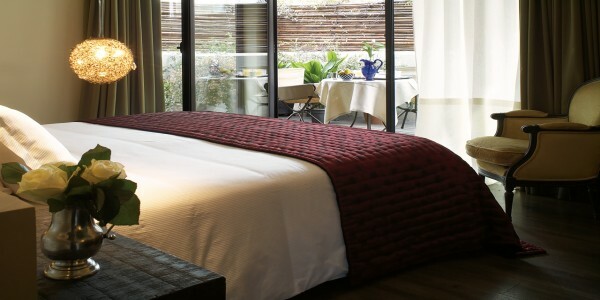 Natural daylight flows through large windows into our hotel rooms in Barcelona. Our spacious standard rooms provide 5 star services and amenities. The Superior Rooms are characterized by being located starting from the 9th floor giving our clients unmeasurable views of the city of Barcelona through their grand windows. All our spacious superior rooms provide 5 star services and amenities. 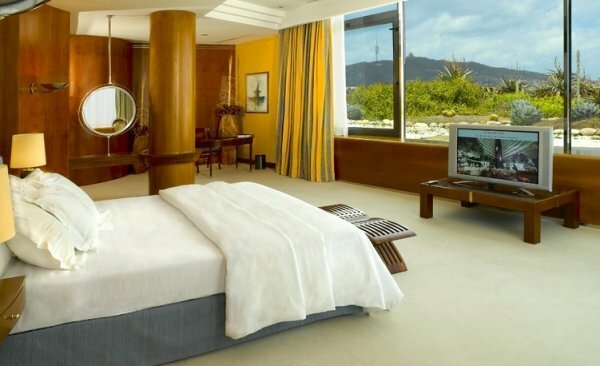 The Hotel Rey Juan Carlos I Executive Floor offers 32 exclusive double executive rooms. Our 12th floor rooms offer spectacular views of Barcelona. Our personalised service provides a boutique hotel experience with all the facilities of a large hotel. Our executive floor offers free internet connection, international press and business centre services. Enjoy four meals a day in our Executive Lounge from 7 a.m. until 11 p.m. The Hotel Rey Juan Carlos I Junior Suites offer a comfortable bedroom and large living room with elegant and comfortable furniture and guest bathroom. 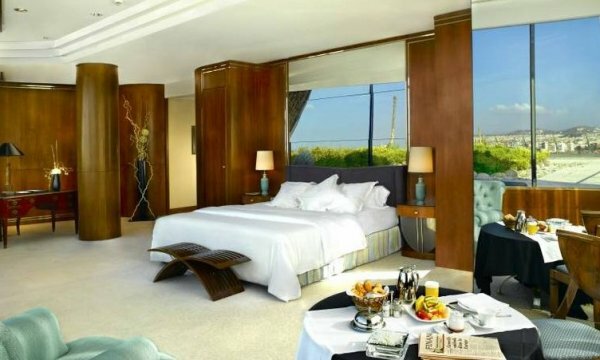 For an even more expansive suite it is possible to connect the Junior suite with a double standard room. The Hotel Rey Juan Carlos I Deluxe Suites are spectacular corner suites composed by one room and one living room with abundant natural light and fabulous views enjoyed through full-length windows. An elegant entrance hall and large living room with stylish furnishings. 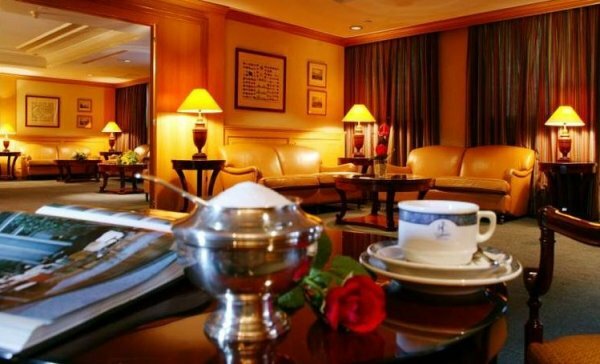 Located on the 14th floor, the Presidential Suite has hosted numerous international personalities. Our spacious and elegant rooms and numerous security measures provide the ideal retreat in Barcelona. The Presidential Suite offers a large bedroom and living area as well as a small kitchen. It is possible to expand the suite by connecting it to a standard room. 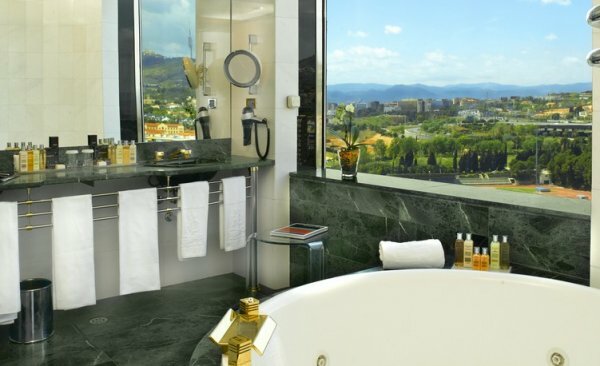 Located on the highest floor of the hotel, the Royal Suite consists of two suites in one: The Royal Suite Polo featuring one bedroom and overlooking Barcelona’s Royal Polo Club and The Spacious Royal Suite Diagonal which has two bedrooms. The suites can be connected and include two staff or security rooms. For hightened privacy and security, the suite has direct access from a private elevator with direct access to the lobby or private car park as well as surveillance cameras in the entrance. A spacious living room and two comfortable bedrooms each features an ensuite bathroom and a perfect location on the famous Diagonal Avenue. The highlight of this suite is the boardroom, with the capacity to seat 10 people, and a magnificent grand piano. The master bedroom features a dressing area and spectacular views from the marble bathroom. 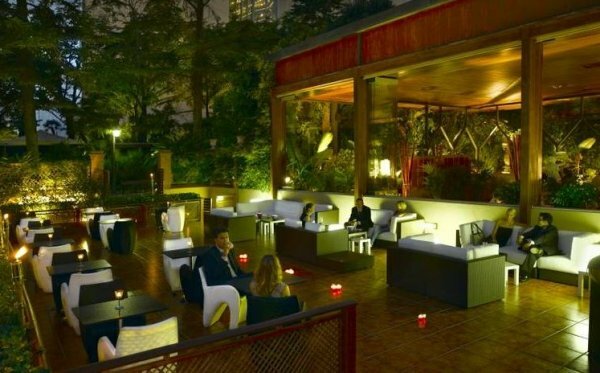 Hotel Rey Juan Carlos I presents dining experiences guaranteed to cater to all tastes. The Garden Restaurant & Lounge offers creative Mediterranean cuisine and is surrounded by tranquil gardens. Enjoy alfresco dining on our terrace overlooking our pool. The Polo Restaurant offers a wide daily buffet of national and international cuisine and “à la carte” menus from our show-kitchen. Enjoy our Ambigu Brunch on Sundays in the Polo Restaurant prepared with the freshest ingredients only. Enjoy a relaxed poolside lunch at the Pool Bar or healthy options at the Fitness Bar. Both bars are open during the warmer months. 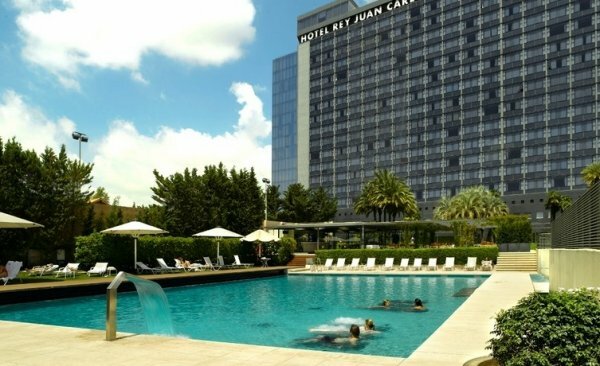 Hotel Rey Juan Carlos I offers guests a variety of bars to unwind and relax with a drink. The cosy wood panelled Aris Scotch Bar is our smoking area and offers a wide selection of beverages and is the perfect place to watch sporting events on TV. 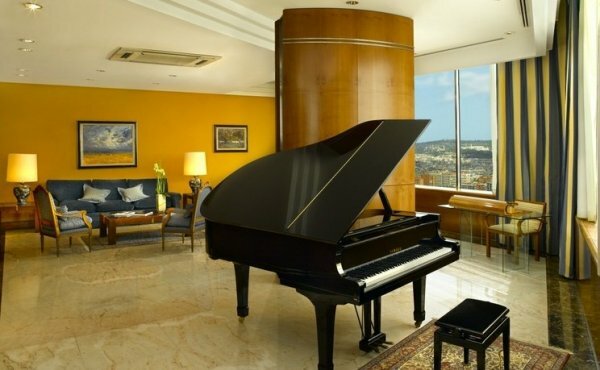 The glamourous Lobby bar is located in our 16-storey atrium lobby and offers live piano music every evening. Both bars offer a selection of delicious sandwiches. Since June 28th, enjoy of a lunch in our pool area. In a quiet and informal ambiance, choose between our great selection of sandwiches, salads and other specialities. The perfect place for an informal lunch during weekdays and special for Saturdays and Sundays with our Barbecue for only 49 €*, children 25 € (water and VAT included). This price allows you to enjoy of the pool and dressing rooms. The swimming pool includes dressing rooms, lifeguards, sun loungers and sunshades. The summer pool will open from June 1st until August 30th. Price (non guests in the Hotel): 25 €, free access for children under 12. Pool open from 10:00 hrs until 20:00 hrs. Barbacue: 13:00 hrs until 15:30 hrs. Pool Bar : 12:00 hrs until 19:30 hrs. * Includes water, coffee and VAT. The Fitness Bar is located next to our heated outdoor pool and The Royal Club Fitness and Spa. The Fitness Bar remains open for the rest of the day offering an innovative selection of sandwiches and salads, juices and imported mineral waters. Open from May 5th to May 18th, from 12h to 18 hrs. Open from May 19th 1st to September 15, from 11 hrs until 19:30 hrs. Unwind in our Lobby Bar. Located in the centre of a 16-storey atrium lobby, Lobby Bar offers drinks and snacks to the accompaniment of live piano music every evening. Relax and unwind in the cosy atmosphere of our Aris bar. Our wood-panelled Aris Bar offers a wide selection of cocktails and long drinks. 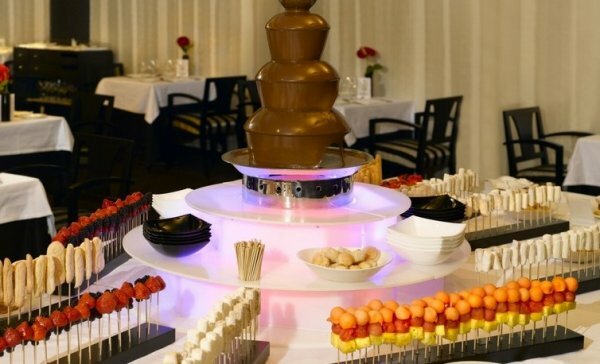 Choose from a tempting menu of salads and snacks while enjoying the company of friends or simply reflecting on the day. Open daily from 18h00 to 2h00. The recently refurbished Polo restaurant is located in the Hotel Rey Juan Carlos I’s spectacular lobby. Select sophisticated cold starters and classic international dishes from our Mediterranean buffet at lunch time for 41,04 € (VAT included beverages not included). Our children’s menu is available at 18 €. From our show kitchen choose main courses prepared with local market ingredients under Chef Jordi Morillo’s supervision. Enjoy our Ambigu Brunch in the Polo Restaurant. Our brunch is prepared using the freshest ingredients to delight your taste buds. Select from an incredible variety of local and international specialities at Ambigu Brunch. Live the best weekend experience with our outstanding brunch. Sundays only. Price: 63,72€ all included, kids until 10 years old 19,00€. 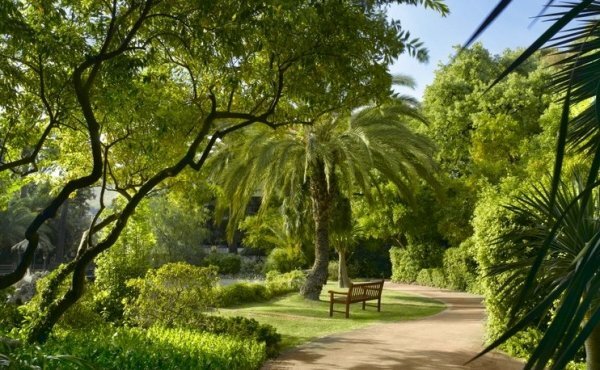 Located in the lush gardens of the Hotel Rey Juan Carlos I, The Garden Restaurant & Lounge offers creative Mediterranean cuisine in a tranquil atmosphere. Enjoy drinks and snacks alfresco on our chill-out terrace with spectacular views of the hotel pool. Opened only for private events.